The HDB mortgage interest rates remain unchanged in first quarter 2019. The Housing & Development Board (HDB) and the Central Provident Fund (CPF) announced this in a joint press release. The CPF Ordinary Account (OA) interest rate will be maintained at 2.5 per cent per annum from 1 January 2019 to 31 March 2019, as the computed rate of 0.40 per cent is lower than the legislated minimum interest rate, the joint press release said. Correspondingly, the concessionary interest rate for HDB mortgage loans, which is pegged at 0.1% above the OA interest rate, will remain unchanged at 2.6% per annum from 1 January 2019 to 31 March 2019. The HDB mortgage interest rates on OA monies is adjusted quarterly. OA monies earn either the legislated minimum interest of 2.5% per annum, or the 3-month average of major local banks’ interest rates, whichever is higher. Let’s say you borrow $250,000 for your flat. Using the HDB mortgage interest rates of 2.6 per cent, for 25 years, the monthly repayment is around $1,134 per month. The total interest paid, at the end of 25 years, is $90,252. Now let’s say you got $250,000 from the bank instead. At a rate of two per cent for 25 years, the monthly repayment is just $1,060 per month. At the end of 25 years, the total interest paid is $67,891; a difference of $22,361. But HDB mortgage interest rates used to be much cheaper than private bank loans. If you look at the late ’90s, for instance, the interest rate for bank loans was around three to four per cent. And it’s entirely possible that, in the next 10 years, bank loan rates will rise again to match or exceed HDB rates. But that said, it’s uncomfortable how HDB rates have been allowed to remain more expensive than private bank loans, for almost an entire decade. 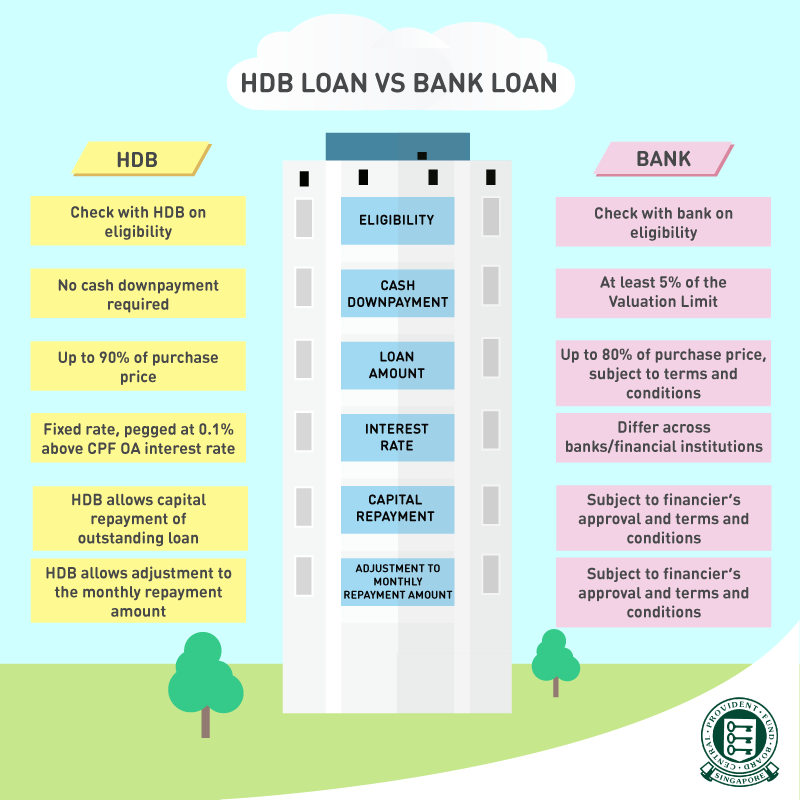 An important consideration when buying HDB flat using CPF is how to determine a suitable loan amount, repayment period and repayment amount that is within your financial means. You can try the various calculators which provides an estimate of an affordable home price, taking into consideration your gross household income and expenses, as well as the repayment amount with its repayment period. This is where the services of a mortgage consultant becomes useful when buying HDB flat using CPF. This is because the consultant, being a professional, will be able to estimate an affordable home price, taking into consideration your gross household income and expenses, as well as the repayment amount and repayment period. A good mortgage consultant would advise you to check the property prices in the areas of interest and compute their finances and fees payable, to ensure that you are buying within your financial means. A good consultant would also ask you to be mindful not use all your CPF savings to finance their private property, because CPF is essentially for ones retirement. The more it is used for property, the less one may have for retirement. One also has to bear in mind the other items one is servicing with your CPF savings (such as children’s local tertiary education and insurance premiums; and the reduced CPF contribution rates as one ages).